Smudgy Antics: MARCH CHALLENGE..... ANYTHING GOES. 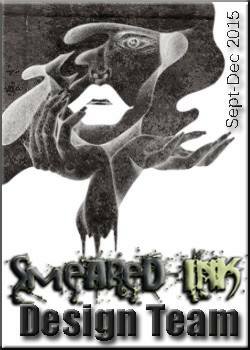 Welcome to Smudgy Antics, the SMEARED INK design team Challenge Blog! Many thanks to all who entered our challenge last month and to those who have been visiting every day to see the DT's projects. Check out the vast array of images and rubber stamps available from the shop. Please read the rules in the side bar. and we love the art that other challenge blogs don't accept. Think outside of the box, bring your best game and join us this month. a real rubber stamp from QUOTH THE RAVEN . I used a mixture of alcohol pens, pencils and ink to colour my page. For inspiration, check out the projects from the Smeared Ink DT on a daily basis. To enter for this month's Anything Goes Challenge, add your link below to Inlinkz. Be sure to link up to your actual project post, not your blog home address, so that we can find your project. The deadline to enter is SUNDAY 29th MARCH at midnight PST. Thanks for so much for playing! Gorgeous Inspiration. Thanks for the challenge! Click above to add your project to our current challenge. *Every month a new Anything Goes challenge will be posted. *To participate, you must make a NEW project that features at least 1 STAMPED or DIGI IMAGE... FROM SMEARED INK ,add it to the post using the Inlinkz linky. Any other supplies and images may be used. Your link MUST take us directly to your project on a PUBLICLY ACCESSIBLE blog or website, or it will be disqualified - so please make sure you're linking to your actual post. It must be linked by midnight Pacific Time on the scheduled end date, which will be three days before the end of the month. You must use a new project; back-linking is NOT allowed. *Your project can be anything (card, scrapbook page, mixed media, altered or 3-D item, etc) as long as it is handmade and stamped somewhere with at least 1 rubber or digital stamp....from SMEARED INK . We have taken into consideration our digital artist fans and will be allowing all-digi projects. Please note that while collage sheet images can be used in your project, the collage image does NOT count as a stamped image. You still need to use a rubber or digital stamp somewhere on your project. Feel free to think outside the box and have fun with your project! We are all about looking at things differently and look forward to the variety of projects and mediums we are sure to see. *You can only enter the challenge and qualify for a prize if you are, or become, a follower of the Smudgy Antics blog. Also, you must mention Smudgy Antics in your blog post and provide a link to our blog. This helps others to find us so they may play along as well. *Multiple projects are allowed as long as each project follows the rules. Each project must be linked individually into the Inlinkz linky tool and must link to it's own individual blog post in order to be considered as separate entries. (Multiple projects in one blog post will be considered as 1 entry). *The winner will be chosen by RANDOM DRAW and will be revealed on the last day of the month. The winner will get BOTH the prize and a winner's blog button to display on their blog. A TOP 3 will be voted for by the DT and shall get a WINNERS BLOG BUTTON... Only the best projects will win TOP 3 so bring your A-game! Check out our Smeared and Smudged Blog, where we host all of our annual events and keep you up to date on everything Smeared Ink! WINNER OF MARCH 2015 ANYTHING GOES CHALLENGE. Bunny Blue and Kitty Too! "Pieces of Me" altered jigsaw puzzle pieces! Friday Inspiration with The Grim Reaper.